Jones Spring, Oregon County What is a Spring? Springs are places where water flows out of the ground under its own volition, either as a result of gravity or hydrostatic pressure (hydrostatic head.) Occasionally well drillers will hit a layer of ground water which then flows out without being pumped-- this is known as an artesian well. Springs may be of either fresh water or mineralized water, in which case the spring is then termed a mineral or salt spring. These mineralized waters were early recognized as having great economic value by settlers as sources of salt and other medicinal minerals. In general, springs can be categorized by their geographic setting. Some springs are seeps, in which the water flows out of sand, soil or gravel with no discernable outlet. Seeps are common along impermeable layers of shale, or porous rocks which hold much water such as sand layers, or sandstones. The highly fractured limestones and dolomites of the Ozarks also support seep springs along their fractures. Much spring water enters Ozark rivers directly from the water table via seeps in river bottoms. These are detectable by the coolness of those areas underfoot, and increases in river flow, with no creeks or surface drainage entering the stream. The most common type of Ozark spring is where an underground stream or conduit flows from a hillside, typically as a cave stream. These spring supply passages usually emerge at ground level, or on a cliff, often along a layer of impermeable rock, creating a waterfall. Depending on the size of the passage and whether or not the passage is partly air-filled, these may be enterable by divers or cavers. Sometimes completely water-filled underground streams flow quite a distance below the surface, and drain relatively large tracts of land. Water enters the ground at higher elevations, draining downward through cracks and crevices until they form a powerful conduit with the water under pressure. In the last few hundred feet these streams cut "uphill" at an angle of 20 to 45 degrees, emerging under pressure, often through a narrow area called an orifice, or from beneath an underwater bluff. Such spring basins often look like a funnel with a bent filler tube. These sorts of springs are of great interest to hydrologists, because they record how groundwater moves in a karst area. 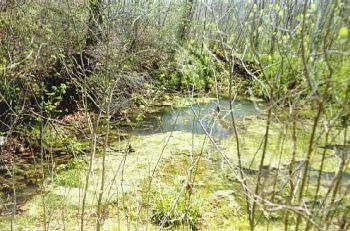 Most of Missouri's well-known large springs are of this type. Some of these springs actually flow beneath the local surface streams. The accompanying diagram shows the major parts of a spring and cave system. This page last updated on May 1, 2006. Return to Missouri Springs homepage.